The demands of the new digital economy have made IT more essential to business success than ever before. IT now enables business transformation, helping organizations compete, grow and innovate. 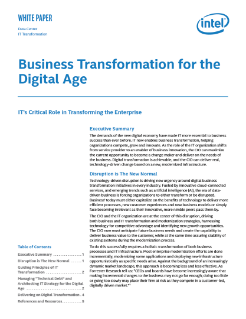 As the role of the IT organization shifts from service provider to an enabler of business innovation, the CIO can maximize the current opportunity to become a change maker and deliver on the needs of the ...business. Digital transformation is achievable, and the CIO can deliver real, technology-driven change based on a new, modernized infrastructure. Advanced analytics is reshaping the enterprise with new discoveries, better experiences and improved products and services.